Exploring an exotic new place is wonderful and fascinating – until you need a toilet. Then the strangeness can be intimidating, and cause delays at the worst possible moment. Italy doesn’t have many public toilets. You will find them in the larger railway stations. Expect to pay, e.g. 70 euro cents in Milan’s Central Station. This is a good thing, because it means that an attendant is constantly on duty, keeping those bathrooms clean. In smaller railway stations, there is almost always a little building with bathrooms at one end of the platform; these are usually squatters, cleanliness is variable, and don’t expect to find toilet paper (when travelling anywhere in the world, I usually carry packs of tissues for bathroom use). If you’re travelling by car, any highway gas station and rest stop restaurant/bar will of course have toilets. These, too, are usually attended and clean although they are often unheated! You should leave a tip for the attendant, 50 cents to one euro. When you’re walking around a city or town, finding a toilet is a little trickier. Very occasionally you will find public toilets maintained by the city; cleanliness is highly variable. My usual solution is to go into a (coffee) bar, use the toilet, and then buy something – cup of coffee, glass of mineral water or, if I’m really not thirsty, a pack of gum. Using the toilet without being a paying customer would be rude, though you can get away with it without incurring anyone’s wrath if you’ve got a small child or an obvious emergency. Be aware, however, that many bars, especially smaller ones, only have a squat toilet. These are more hygienic because the only part of you that touches the toilet is your shoes. However, it takes good knees, balance, and some practice not to pee on your own feet. 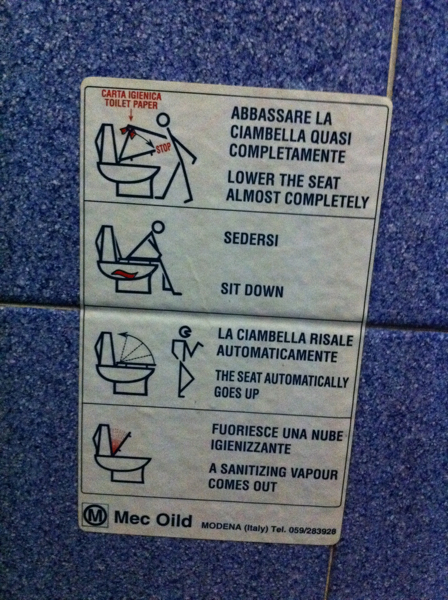 Add your own Italian toilet tips. This entry was posted in Italy travel and tagged Italy travel, toilets on July 14, 2006 by Deirdre Straughan. The local newspapers last week reported with glee that Ken Livingstone, the mayor of London, never flushes the toilet after peeing – he stated this publicly, hoping to increase awareness of the global need for water conservation. The immediate reaction of a reader of Metro (the freebie paper that I read on the train) was to extrapolate that Livingstone never flushes at all, and express horror at the probable state of his bathroom. Another reader took the argument further, excoriating all environmentalists as stupid. In today’s round of letters, an Italian environmentalist says that Livingstone’s initiative is “exaggerated and unrealistic,” but that we shouldn’t therefore condemn all environmentalist ideas. Evidently the concept of the no-flush urinal has not reached Italy. I wrote to Metro myself (it went unpublished) to point out that in many countries there aren’t even toilets, let alone water to flush them with. During my years at Woodstock we had water shortages, sometimes so severe that water had to be carried in buckets from a rainwater storage tank for toilet flushing and everything else. In that situation, you don’t bother to flush every time, nor should you use up scarce water to do so. David Pollock’s book on third-culture kids recounts the story of a child raised by missionary parents in a water-poor country in Africa, who grew up with the rule: “If it’s yellow, let it mellow; if it’s brown, flush it down” – a habit which horrified his grandmother when he stayed with her in the US! Italy is rich in water – for now. But when the Alpine glaciers melt away entirely, as they seem likely to do in a few decades, Italians will need to learn to be less fastidious in their bathrooms. This entry was posted in Italian culture and tagged environment, living in Italy, toilets on May 13, 2006 by Deirdre Straughan. Fortunately, there were also stick-figure illustrations, otherwise I would have had to puzzle about “skiing position,” not being a skier. This instruction displays a certain cultural insensitivity; surely, at an international airport, they don’t think that every visitor knows how to ski? It would be useful if other kinds of toilets also came with instructions. I’ve never seen such a bewildering variety of toilets as I have in Italy. The part you sit on is standard (unless you encounter an old-fashioned squatter; some Americans might be confounded by this), but working out how to flush it may be a challenge. American-style tank behind the seat, with flush on upper right corner. The flush may be a button on top of the tank, or a plastic tab sticking out of the upper right side of the tank. High wall-mounted tank (nostalgia items for some of us), with a pull chain dangling down. A simple handle that you turn to open a faucet; let the water run til the evidence is flushed away. This ecologically sound – you use exactly as much water as needed – but it’s frustrating when water pressure is low and you’re in a hurry to leave the bathroom. Buttons on the wall somewhere, usually (but not always) above the seat. This can be a small metal button, or a round plastic one, mounted on a larger plastic plate, that you push once to flush. The cleverest I’ve seen is the double button, a trapezoidal shape divided into larger and smaller sections. I assume that this is a water-saving feature, where the size of the section determines the size of the flush: push the small button for a small job, the big button for a bigger job, or, if you’re really worried, both buttons together. Step-on rubber button near the floor, sticks out at an angle, usually on the right side of the bowl. Step on it hard for as long as you want the flush to last. Note that the “helpful” graphic shows an impossible foot position. Wave-activated sensor. When you’re done, wave your hand in front of the photocell on the wall behind the bowl (there’s an illustration encouraging you to do this), and the flush will take care of itself. Automatic flush. These are supposed to detect when you sit down and when you get up again, but they are almost always miscalibrated and go off while you’re still sitting. And they tend to flush hard – eeyow! that water’s cold! Worse, this is the type most commonly found in roadside rest stops, where the bathrooms are not heated in winter. When you’ve conquered the toilet, you face the challenge of washing your hands. Many bathroom sinks are equipped with photo sensors, but these can be fussy. 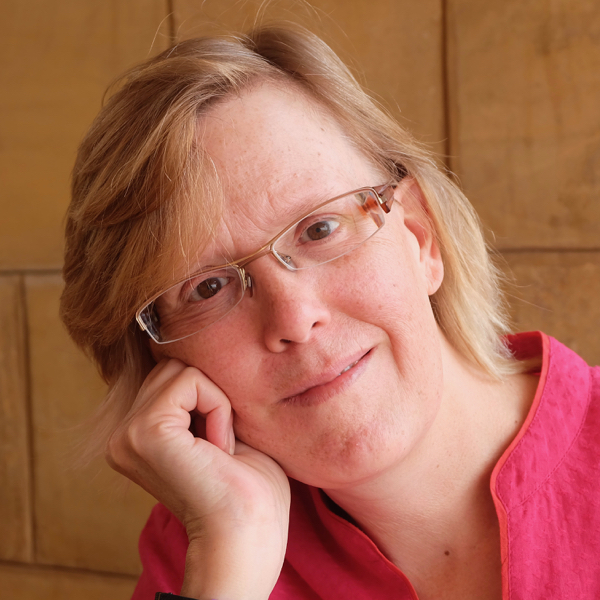 I have one friend whose hands are transparent to them – no amount of waving around will get her any water; someone else has to put their hand in front of the sensor for her. 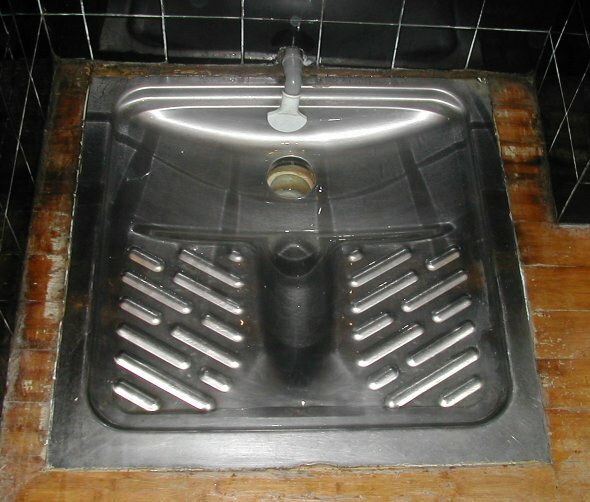 Some faucets are activated by pedals on the floor, one for hot and one for cold – highly sanitary, as you don’t have to touch anything with the hands you’re trying to clean. I’ve even seen sensor-activated soap dispensers! I have never in my life associated cold white porcelain with “warmth” and “cosiness”, so I wonder if they also produce office furniture. If they can make a toilet radiate warmth, imagine what they could do with a desk or chair! 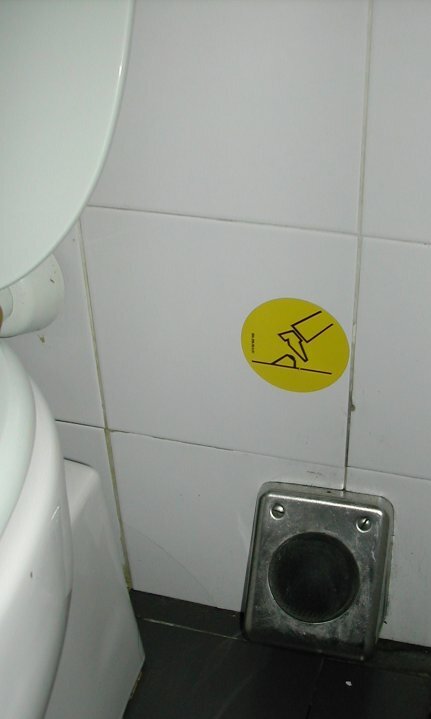 Another American looks at Italian toilets, with photos (site not for the squeamish!). This entry was posted in Italy travel and tagged Italy travel, toilets on March 13, 2003 by Deirdre Straughan.